The Vashon Beachcomber published this piece about our show featuriing Visqueen. 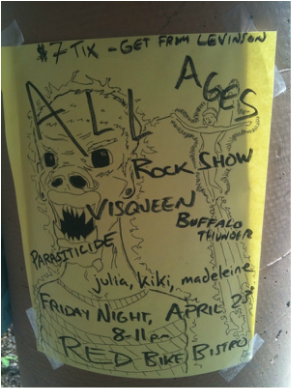 Visqueen, a power-pop-punk band that has been on the Seattle scene since 2002, will take the stage at 9 p.m. First, however, audience members will have a chance to hear music made by talented Island youth. The local opening acts, set to take the stage at 8 p.m., include Vashon High School student Skyler Ford, who will perform with his band, Buffalo Thunder. Three other VHS students — Madeleine Wolzcko, Julia Hanowell and Kiki Means — will perform as well. The concert is being produced by two music-loving Islanders, Rob Bordner and Fred Strong, who are both parents of recent Vashon High School graduates. Bordner also has a daughter who currently attends VHS. With Friday’s show, Bordner and Strong are setting the bar high for their new venture. Visqueen is one of the Northwest’s most popular bands. The group is fronted by Rachel Flotard, a dynamic singer and songwriter who is also known for her work with Americana darlings Neko Case and Jon Rauhouse. The band’s latest album, “Message to Garcia,” made several top ten lists in 2009 and received significant airplay locally on KEXP, as well as wider attention on NPR and other national outlets. Visqueen routinely sells out Seattle’s major clubs and other venues throughout the region. They recently returned from a gig at the prestigious South by Southwest festival in Austin, Texas, and will soon depart for a month-long East Coast tour. Rave reviews of Visqueen’s music have appeared in the Village Voice, Spin, Rolling Stone and countless other publications.